The Kentucky Chamber’s Director of Public Affairs, Chad Harpole, has joined members of the Kentucky World Trade Center on their China Coal & Mining Trade Mission. The trade mission is a ten-day journey to China where participants will explore some of the most advanced technology in the coal mining industry at the China Coal & Mining Expo. Participants will also have an opportunity to see some of this technology being used in the Inner Mongolia mines, which was China’s largest coal producing region in 2009. Below is an account of his trip to Inner Mongolia. I admit that I bought into the American media’s perception that China does not care about carbon emissions. Looking out my hotel window in Beijing, the smog that blankets the city made the air look dense and thick – similar to what Kentucky looks like in the heat of July. During a visit to Ordos, Inner-Mongolia, however, I learned that the Chinese government and people actually do care about carbon emissions – and are doing something about it on a much larger scale than America. Ordos is home to the world’s largest coal-to-gas-liquefaction plant and the world’s largest carbon capture and sequestration project. The trip was a fascinating exercise of what our country could do to reduce our dependency on foreign oil sources. This plant, which cost about $2 billion to construct, produces virtually zero emissions while creating around three barrels of oil per one ton of coal. 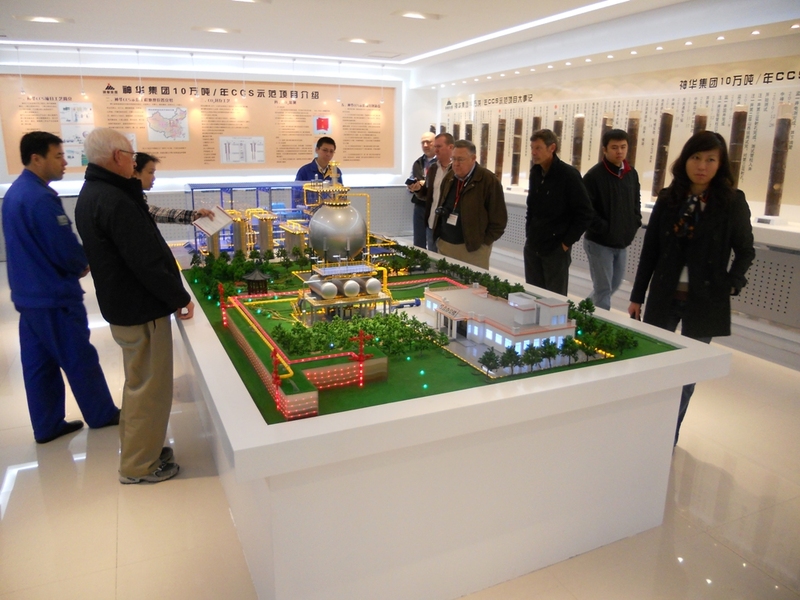 This is a pilot project for China and is currently producing around 1,800 barrels per day. While that’s not a large amount of oil for the amount of space and financial investment the plant consumed, it at least proves that the technology exists to produce oil from coal – a resource that China and the U.S. have an abundance of. Just around the corner from the coal to gas liquefaction plant is China’s carbon capture and sequestration project. This project takes the carbon from the coal to gas liquefaction plant and pumps it 2,500 meters into the ground for permanent storage. The project is pumping around 300 tons of CO2 per day into the ground. This may sound like a lot, but many experts estimate there is around two tons of CO2 per one ton of coal emitted from the typical coal-fired power plant. Kentucky’s Energy and Environment Cabinet has a similar demonstration project underway in Western Kentucky with various partners including the University of Kentucky’s Center for Applied Energy Research, many electric utilities and Kentucky Chamber member Smith Management Group. Both of these projects demonstrate China is on the forefront of making the most out of the best clean-coal technologies while improving air quality for their citizens. Kentucky Energy and Environment Secretary Dr. Len Peters and members of the Clean Coal Tour look onto a model demonstrating China's carbon capture and sequestration project.